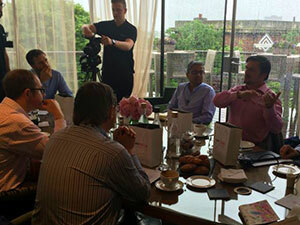 At a UKFast round table debate at The Roof Gardens in Kensington, Magento experts gathered to discuss the improvements to the new version of the popular eCommerce platform. Lowri shares the insights. With online shopping expected to surge past the $1.5 trillion marker in worldwide sales this year, eCommerce is becoming one of the fastest-growing and most valuable industries to date, with £10bn spent online last year alone. Developers, retailers and business owners are looking to stand out, so does Magento give them this edge? The experts discussed which core features set Magento apart from other eCommerce solutions, which security considerations should be in place when using Magento and the platforms nipping at its heels. Bharat Sharma, director of eCommerce and digital content development agency Monsoon Consulting, believes there have been incremental improvements to Magento 2.0. Alex Shepherd, commercial and marketing director at Magento specialist agency Space 48, believes Magento 2 had to improve to keep up with the growing tech industry. He said: “Things have moved on a great deal in the world in terms of technology so it had to improve. From a community edition point of view the platform is quite different. There have been many improvements built into the core including increased browser rendering, better image compression and static content caching which have delivered huge speed improvements. The new code base is a vast improvement and one which has enabled us (in some instances) to see speed improvements on the back end development. The functionality and intuitive nature of the admin panel is also much improved. Nick Williams, COO of fancy dress clothing site Escapade, believes Magento is the best platform for eCommerce. If you’re interested in debating the hot topics of the day at our round tables, take a look at our web page, and sign up to our YouTube channel to get the latest videos and insights from our film team!